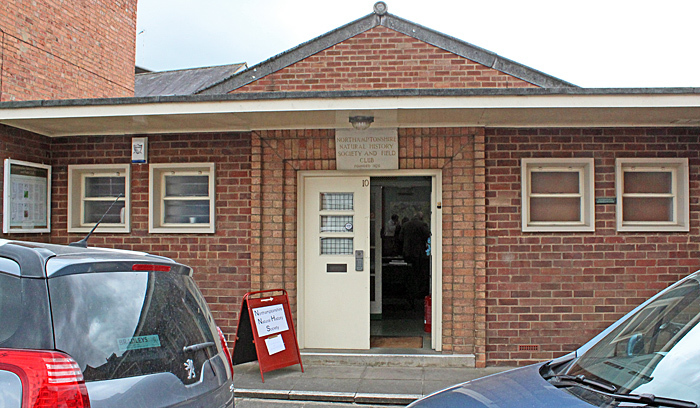 Most microscope club meetings are held in halls that are hired for the event, but the Northamptonshire Natural History Society is fortunate to own The Humfrey Rooms in Northampton. 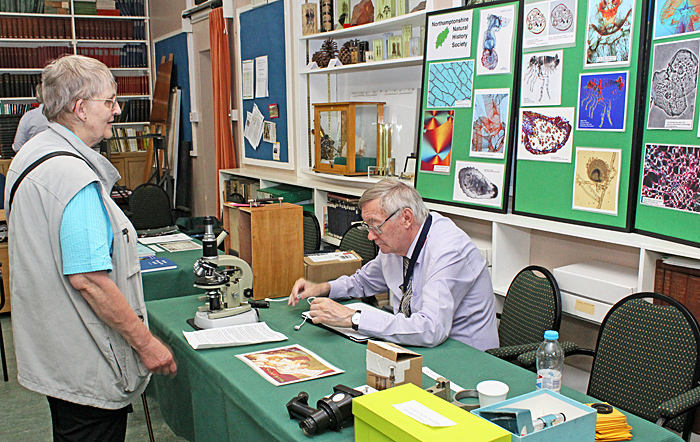 The main hall used for the Annual Exhibition of the Microscopy Section is lined with interesting books, specimens and equipment, although of course the main interest was the tables full of microscopy exhibits, demonstrations and sales. 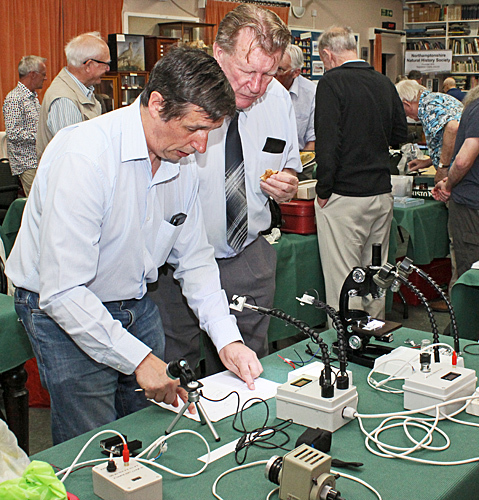 Chris Kennedy had three microscopes for sale to raise funds for the RMS Schools Microscope Fund, a Vickers M12 metallurgical, a monocular Swift M3200 and a binocular Swift. 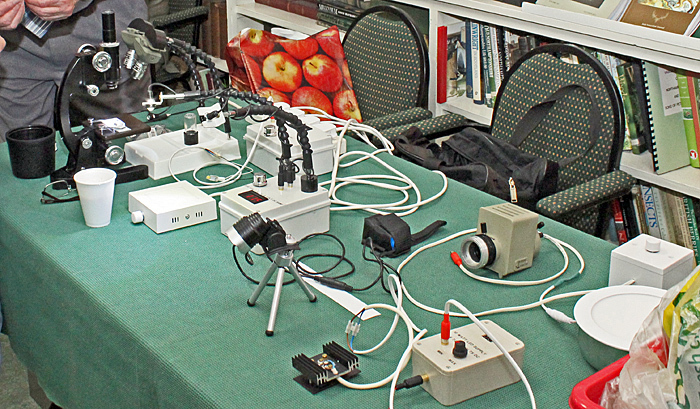 Colin Lamb showed several LED light sources that he had made, with versions for stereomicroscopes, compound microscopes and macro photography. 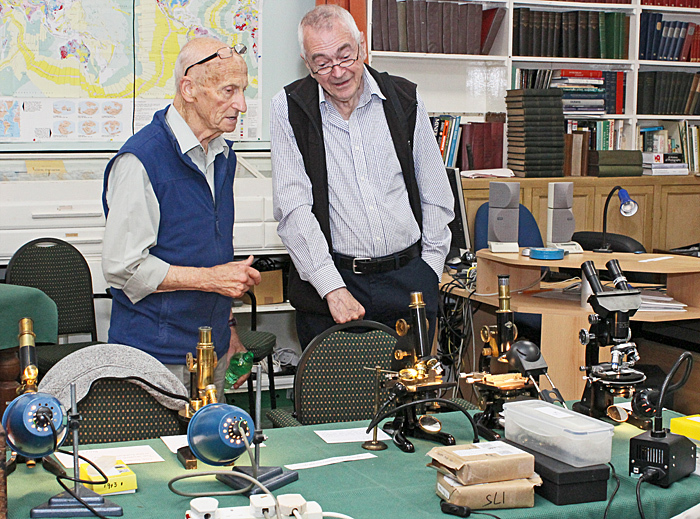 Colin was also selling 2 microscopes, a grey Zeiss Amplival stand and a black and chrome metallurgical Cooke, Troughton & Simms with both the body tube and the stage on rack and pinions, allowing large specimens to be viewed. 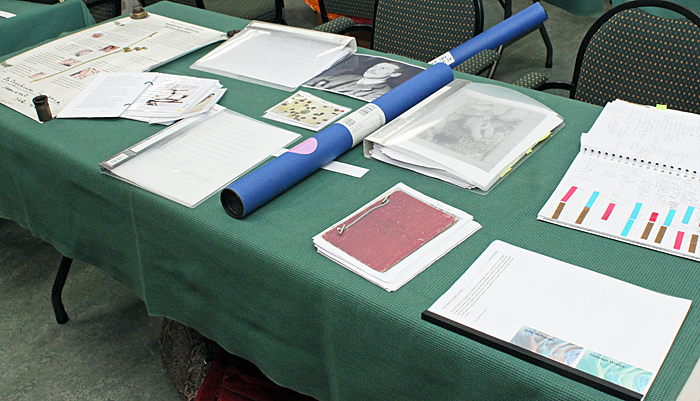 Jacky McPherson displayed items about the amateur slide mounter Eric Doddrell Evens, including photographs, a poster and PMS notebooks. After lunch, Jacky gave a talk on the man and his slides. 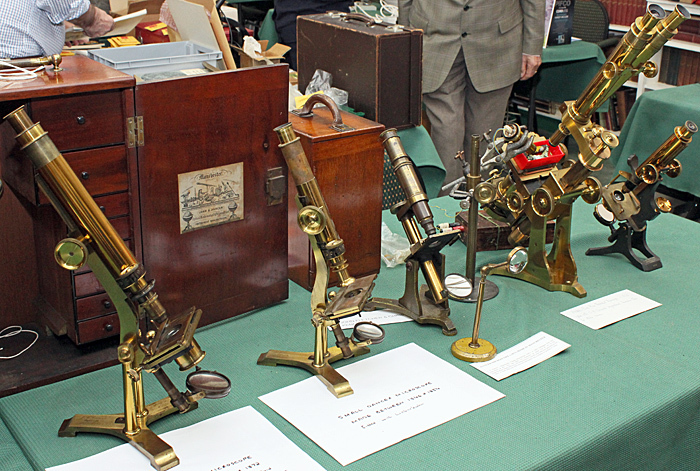 John Fletcher exhibited 6 brass microscopes, including an Andrew Ross Bar Movement with J. B. Dancer’s symmetrical binocular tubes for stereo vision (used to examine lichen), and some Dancer microscopes of various sizes with a range of accessories. 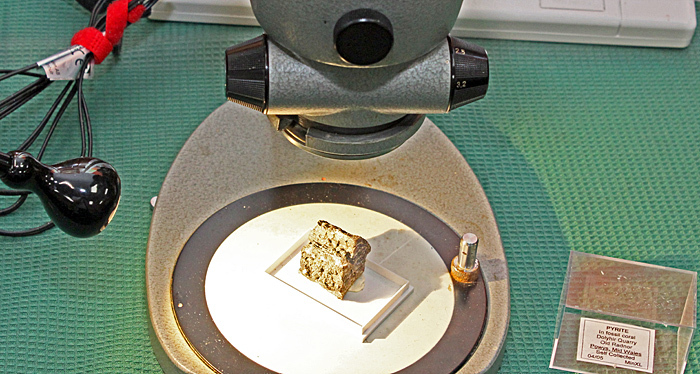 Kit Brownlee used her Zeiss stereomicroscope with an Ikea Jansjö LED work lamp to show pyrite particles in a piece of fossil coral (Heliolites interstinctus (L.)). 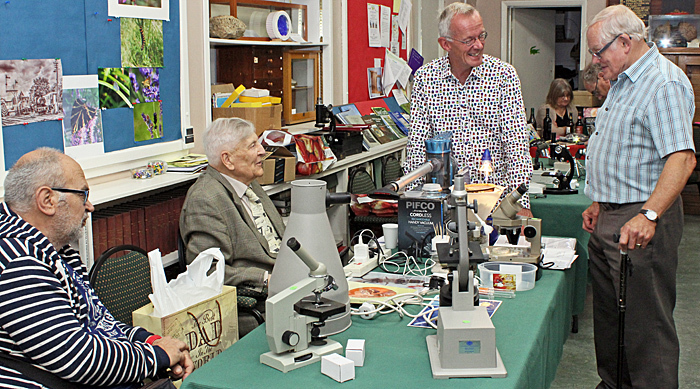 She also brought 2 books, Rocks and Minerals by Chris Pellant and British Palaeozoic Fossils. 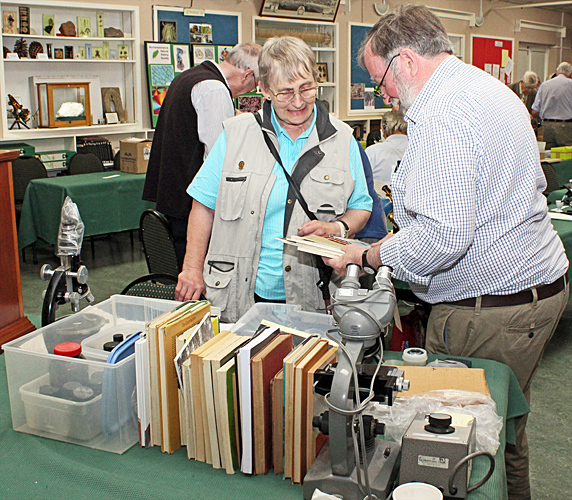 Kit was also selling some used books, an Olympus KHC microscope, an Olympus TF transformer, a black and chrome polarising microscope, colour filters, stereo objectives, eyepieces, objectives, small mineral samples (micromounts) and stains in powder form. 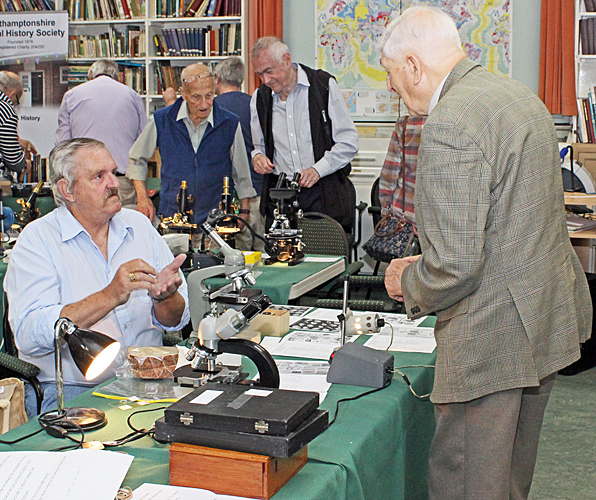 Les Larkman’s exhibit was on springtails (Collembola), and he had a Vickers stereomicroscope for viewing specimens, a copy of A key to the Collembola (Springtails) of Britain and Ireland by Stephen P. Hopkin, a Tullgren funnel to demonstrate how to extract springtails from soil and vegetation, colour photos and notes on keeping Collembola as pets. 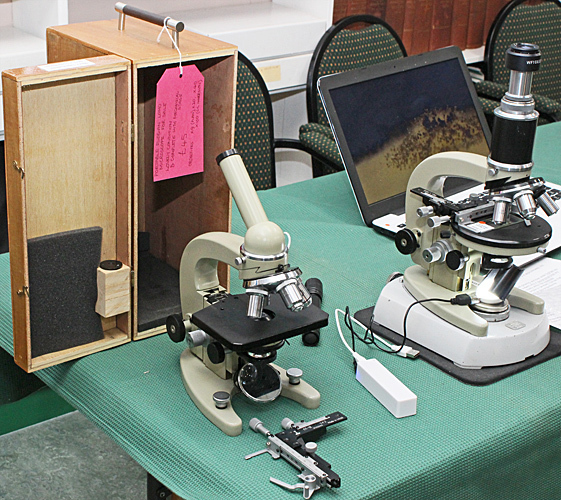 Les was also selling a monocular Lomo microscope and a C&D microprojector. 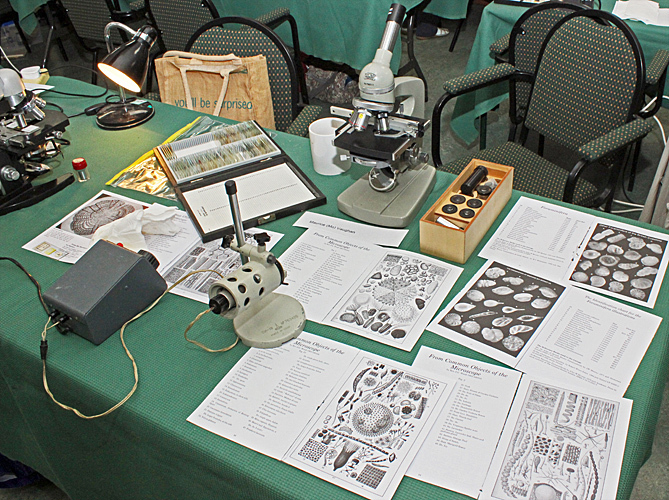 The subject of Mike Gibson’s exhibit was the fungal order Mucorales, with photographs, slides for viewing on his Lomo microscope, and a computer with photographs and videos. 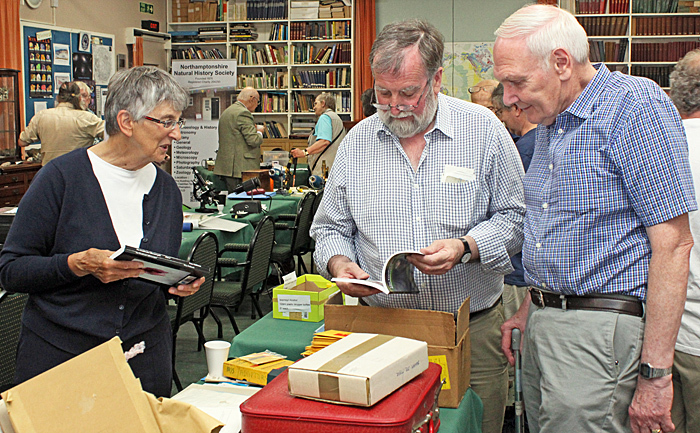 Mike was also selling a camera attachment, a focusing mount for a stereomicroscope, plastic slide mailers, toluidine blue in dropper bottles and a small Lomo microscope complete with its wooden case. 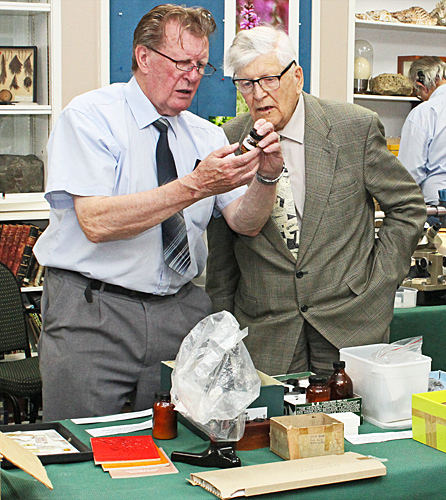 Mike Samworth and Steve Gill were showing Postal Microscopical Society memorabilia (old notebooks and photos of members) and selling new binders for Balsam Post. 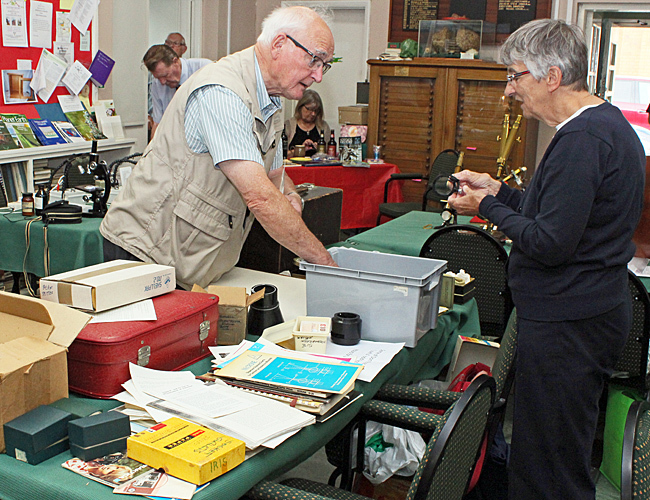 They were also selling used slide boxes, magazines, brochures, objectives (Baker, Lomo, Opax and Zeiss), Zeiss eyepieces, a Zeiss transformer, a slide copier, and microscope stands by Beck and Watson. 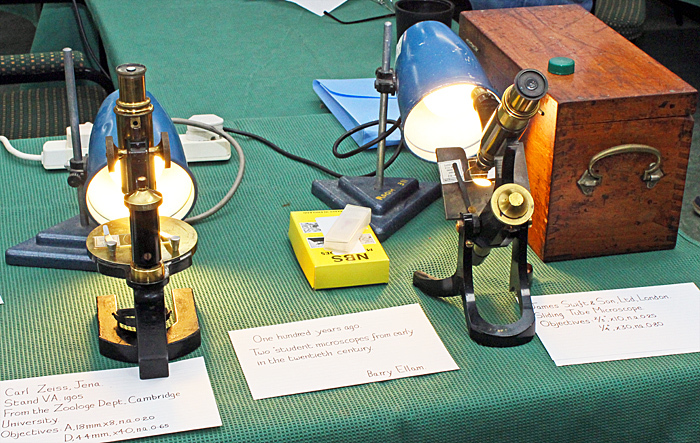 Mo Vaughan showed some illustrations from Common Objects of the Microscope by Rev. 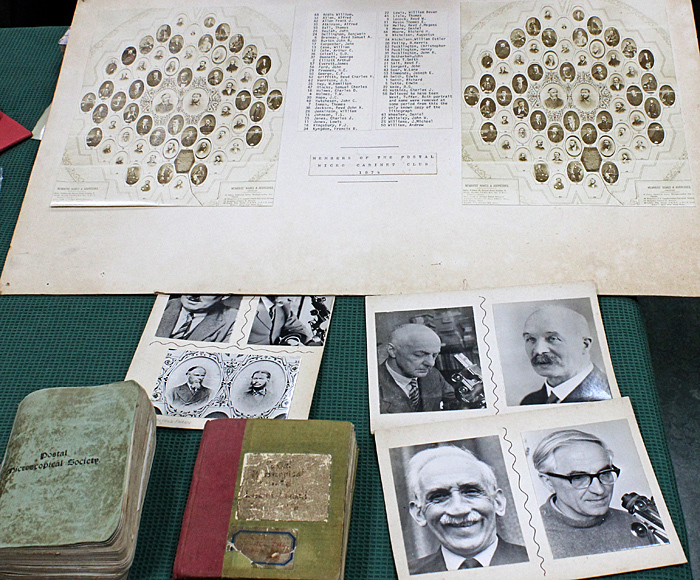 J. G. Wood and some illustrations of Foraminifera of the British coastline, and had slides of similar specimens for viewing with his Kyowa and Meopta microscopes. 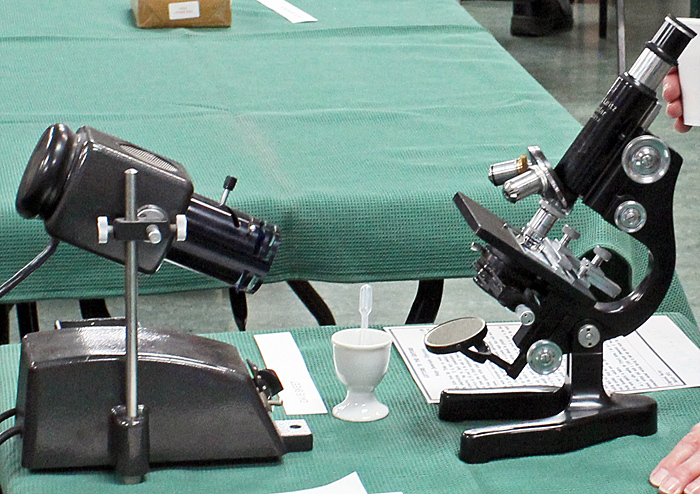 The NNHS Microscopy Section had a sales table with items including a Watson Service stand, stereo objectives, a few books, some bulbs, pipettes, and bottles of chemicals including 100% isopropyl alcohol in dropper bottles. 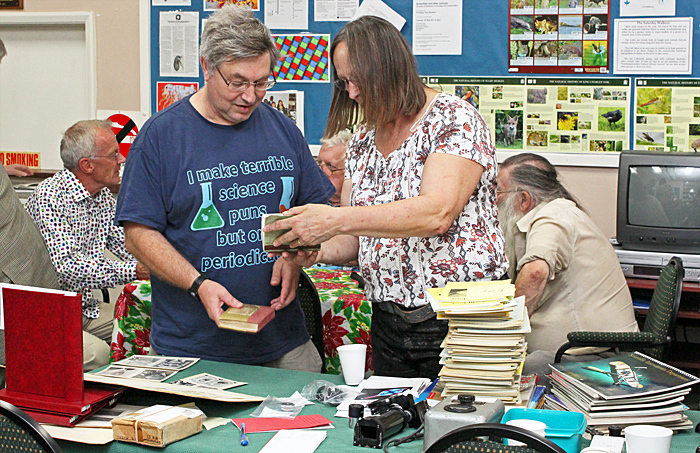 Pam Hamer was selling all sorts of items from Don Thomson’s loft, including ring lights, books, reprints, lenses, prisms, chemicals and lots of unused Wratten gelatin filters. 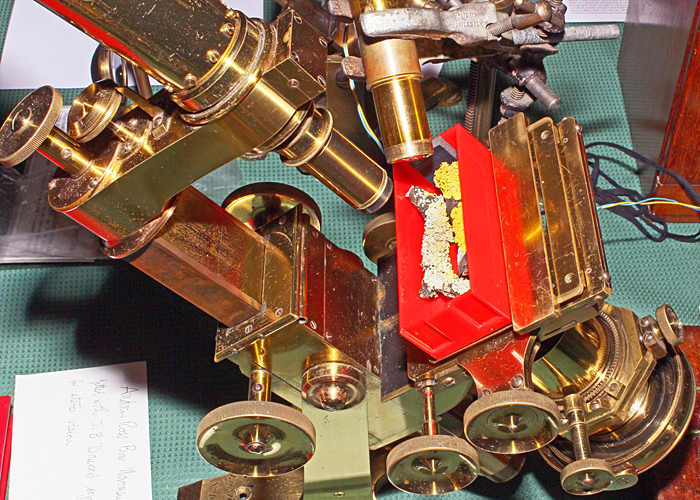 Tim Newton exhibited 3 microscopes, a black and chrome binocular Cooke, Troughton & Simms polarising microscope with a diatom circle by Klaus Kemp, a black and brass Prior monocular with a 4″ objective fitted to the lower end of the drawtube allowing the whole of a 14 mm beetle to be observed, and a black and brass Beck 29 with a mineral specimen under oblique illumination. After a break for lunch and gossip, the tables and chairs were re-arranged for the afternoon session. 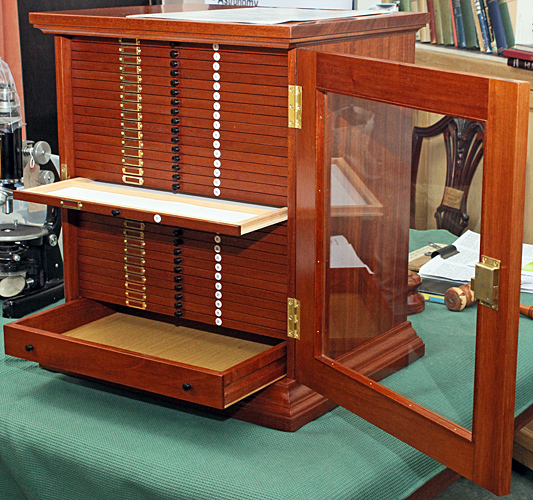 John Birds has made a beautiful mahogany slide cabinet and donated it to the Microscopy Section. He used antique mahogany from furniture originally from Devonshire House that had been salvaged after water damage while it was stored at Chatsworth House. 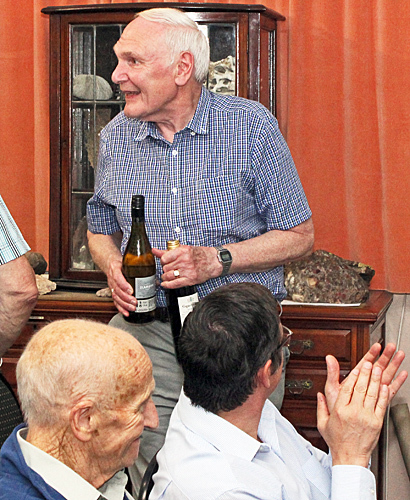 The generous donation was acknowledged with a lengthy round of applause, and a presentation from Cyril Sampson. 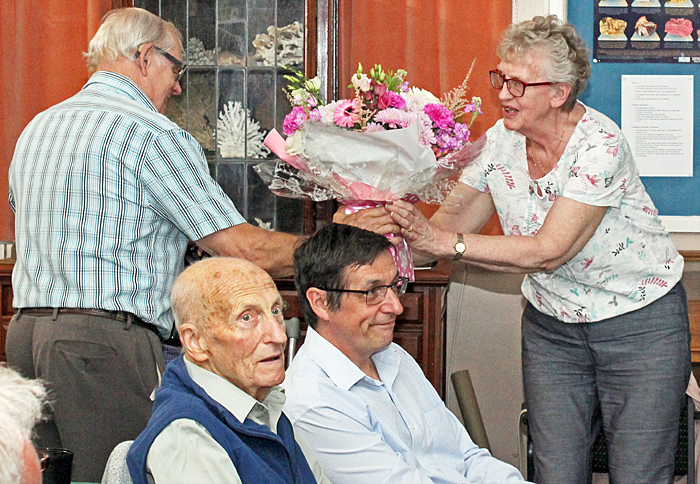 Cyril also presented John’s wife with with a bouquet of flowers. 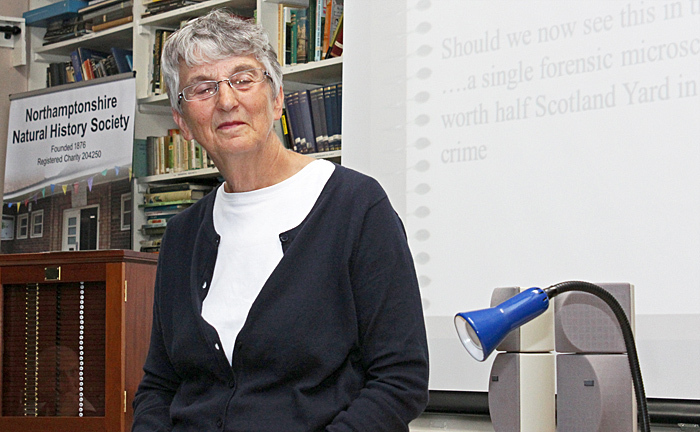 The first talk was by Pam Hamer, on “The microscope and its development in forensic science”. 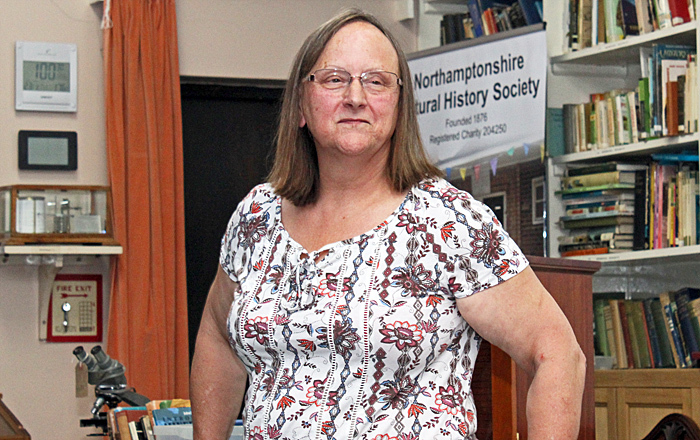 Pam’s talk started from Victorian times with the earliest examples of the use of microscopes to provide evidence in trials, and a man sentenced to transportation to Australia for stealing a microscope. 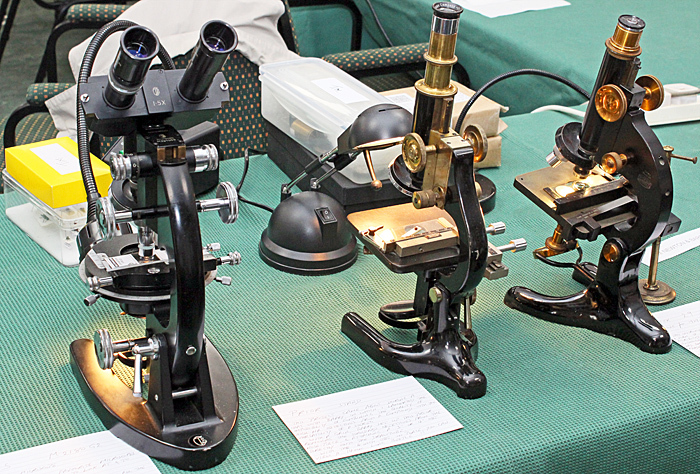 Police forces were initially reluctant to use microscopes, but they were gradually introduced and became an essential tool in forensics. 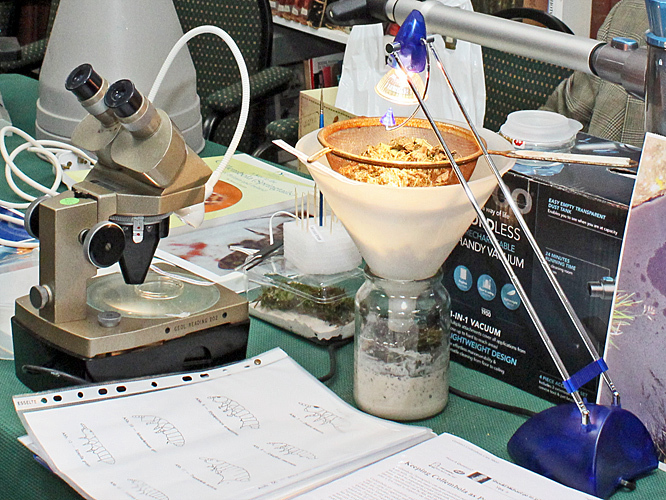 Pam moved on to the equipment that she used to use, including stereomicroscopes, comparison microscopes for striations on bullets, and specialised equipment for measuring the refractive index of glass particles and comparing the colour of paint flecks. 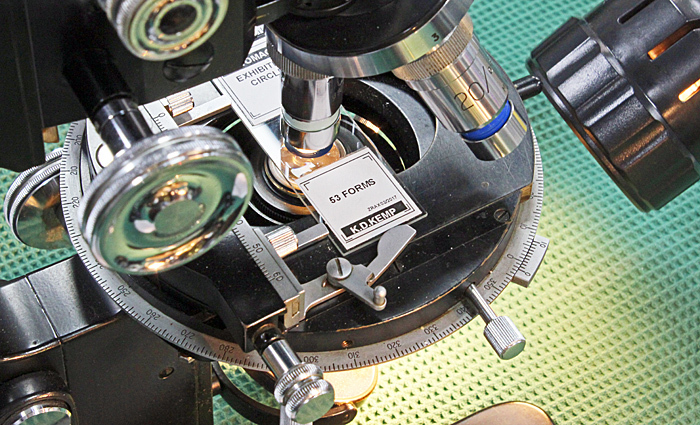 More recently, microscopes have become less important as digital equipment has been introduced and the use of DNA evidence has increased. 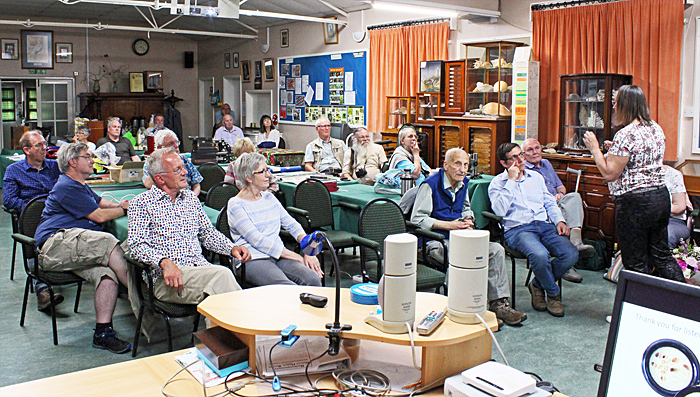 The second talk was by Jacky McPherson, on “The microscope slides of E. D. Evens”. Jacky has become fascinated by the slides prepared by the amateur mounter Eric Doddrell Evens (1893–1973) who joined the Quekett in 1918 and continued making slides until shortly before his death in 1973. The Quekett has about 2300 of his slides in its collection. 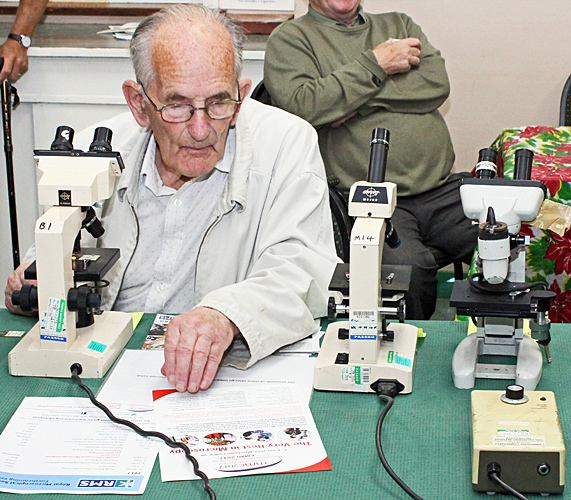 Jacky informed us about the man and about his specimens, slides, chemicals and preparation methods. 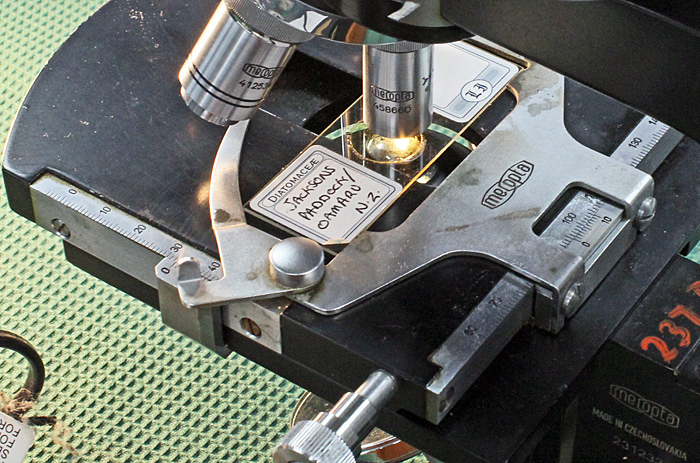 Jacky has updated her presentation and kindly made it available as a PDF: Seventy years of making microscope slides.